Item # 312287 Stash Points: 795 (?) This is the number of points you get in The Zumiez Stash for purchasing this item. Stash points are redeemable for exclusive rewards only available to Zumiez Stash members. To redeem your points check out the rewards catalog on thestash.zumiez.com. 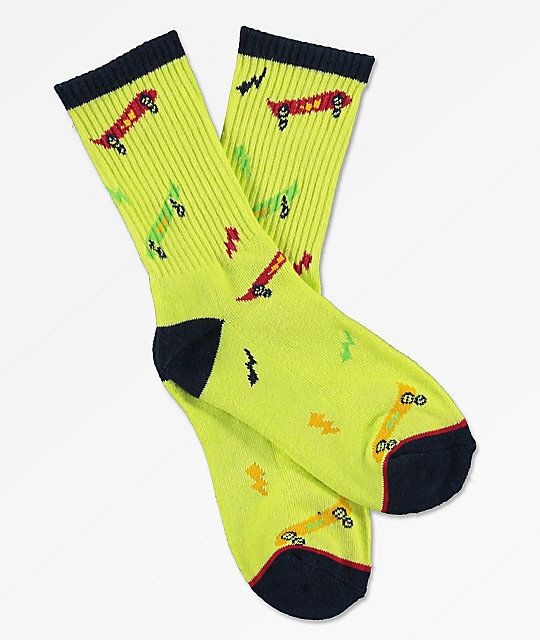 Show off your dedication for skateboarding in bright and unique style, with the Boys Ollie Neon Crew Socks from Empyre. Coming in a neon green colorway with jacquard knit skateboards throughout and finished with navy blue toe boxes, heel cups, and upper trim, these socks are the perfect way to show love to your favorite activity. Boys Ollie Neon Crew Socks from Empyre. Navy blue toe box, heel cup & upper trim.